Today would have been my mother's 78th birthday. My mom enjoyed hearing about my new friends all around the world and the minis they were working on. She loved seeing all the gifts that you have so generously shared with me. So it seemed like a perfect time to offer you a chance to win a gift in her honor. 1. Be a follower of this blog or M's Lists or become a follower of this blog. 2. Leave a comment on this post on or before May 11, I'll draw a winner May 12, Mother's day. If you win I'll put together a special package just for you. I've collected quite a few porcelain beads that I think work as vases. Mom liked seeing my little finds. Would you like some little vases? 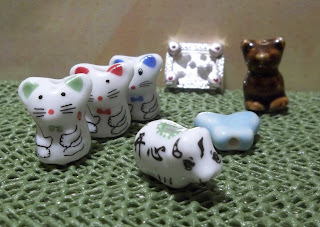 Maybe these 3 little mice will be part of the prize or the cat, butterfly or (I think that's) a cow. Which ones would you like to win? If you win you can have a little silver frame, if you like. I'll show you more of the things that you can choose from as I sort through things, let me know what you like. I think that's it, let me know if I forgot anything or if you have any questions. This is a pecial and generous giveaway. Oooh, I love the vases on the left that come in brown, purple, pink, green and yellow, what a lovely shape! What a lovely tribute to your mother. Please count me in I love the animal beads. I'll put a link in my blog. Those porcelain beads are fab - I think I would love to win them..
Beautiful tribute to your Mother :) Please count me in and if I win I would be very happy with whatever treasure you choose. Hola María me encanta tu sorteo son unos abalorios geniales, me gustaría apuntarme si te parece bien. Subo el enlace a mi blog. Hola querida Mary, sorteas verdaderas preciosidades, me gustaría participar, aunque ya he ganado un sorteo tuyo.. Puedo? Ohhhhh, que bonito y que útil! me gustaria participar, pongo tu enlace en mi blog! Muy bonito que hagas el sorteo en honor a la memoria de tu madre, se sentirá orgullosa de ti, esté donde esté. Me gustaría participar y en caso de resultar ganadora me gustan los colores suaves, así que lo dejo a tu elección. Un beso y gracias, voy a anunciarlo en mi blog. please count me in, I've found your blog just recently but would gladly read it! Hi mary, I am so sorry to hear you lost your mother, but this generous give away is a lovely way to remember her. I would very much like to join in and I will put the link on my blog. If I were so lucky to win, I would love to have some of your lace and a porcelain bead to use as a vase. It is so generous of you to offer so much and give the winner the freedom to make her choice. Que bonito homenaje a tu madre! Te felicito por tu blog, hoy lo he descubierto por primera vez, ya tienes una seguidora nueva. Me encantaría participar en tu sorteo. Mi blog también está de sorteo, ánimo y apúntante! Te anuncio en mi blog. Un abrazo. Arantza. Hace mucho que era seguidora y ahora me he vuelto a hacer, jaja. Me encanta el detalle de hacer un sorteo para el Día de la Madre. Me gustaría participar y me gustan mucho los tres ratoncitos de porcelana. Hola! gracias por participar de mi sorteo y si me lo permites me apunto al tuyo. saludos!! !